Four of our students will be speaking in this public talk, two current honours students, one former and one graduate student. I’m looking forward to this. A day after the announcement, 80 people are signed up already and I am certainly looking forward to the opportunity to meetup with various people in the community – do join us there! Center for the Advanced Study of Behavior, UCLA. “Animal communication occurs when a signal generated by one individual is transmitted through an appropriate channel and results in a behavioral change in a second individual. We have explored specific morphological, physiological and behavioral adaptations in a wide variety of taxa that appear to have evolved specifically to tailor and sculpt intraspecific communication systems. (1) Cross-modal integration as the basis for understanding agonistic behavior in territorial dart- poison frogs, Allobates femoralis. We used an electromechanical model frog (robot) to present territorial males with visual and auditory cues separated by experimentally-introduced temporal delays or spatial disparities to probe temporal and spatial integration in this animal. Our results demonstrate both that temporal and spatial integration may be reliably estimated in a freely-behaving animal in its natural habitat, and that we can use aggressive behavior in this species as an index of cross-modal integration in the field. (2) The second example concerns two distantly related organisms: the concave-eared torrent frog (Odorrana tormota), calling near fast-flowing mountain streams of Anhui Province, Central China, and the endemic Bornean frog, Huia cavitympanum, living in a very similar riverine habitat in Sarawak, Malaysia. In addition to the high-pitched audible components, these species’ calls contain previously unreported ultrasonic harmonics. This extraordinary upward extension into the ultrasonic range of both the harmonic content of the advertisement calls and the frogs’ hearing sensitivity is likely to have coevolved in response to the intense, predominately low- frequency ambient noise from local streams. About the speaker – Paul Sweet has been a birder for as long as he can remember. After graduating from Liverpool University with a degree in Zoology he spent a few years birdwatching aroound the world. 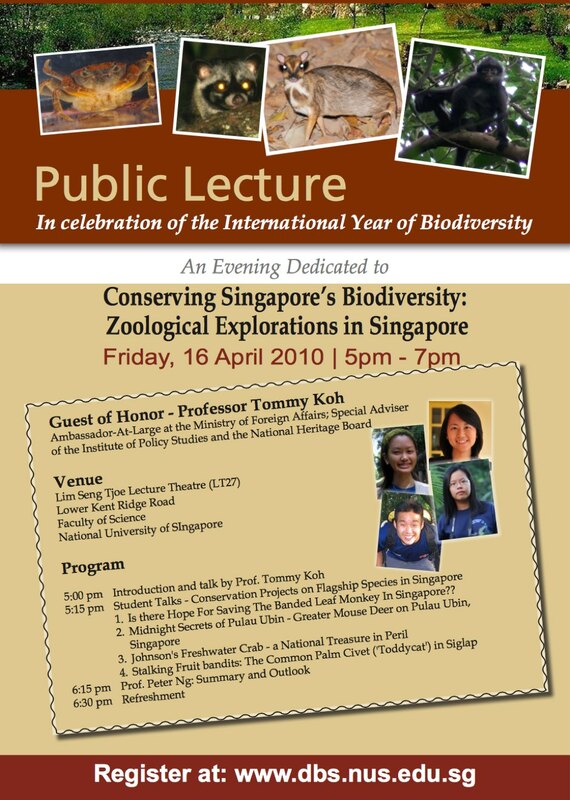 In 1990, he washed up at NUS where he discovered the Raffles Museum which sparked a new interest in bird collections. A year later he joined the staff of the Ornithology Department of the American Museum of Natural History in New York and is now the Collection Manager of the largest collection of 850,000 bird specimens in the world. About the talk – In 1999 and 2000 Paul participated in multi-taxon inventories of two highland sites in Vietnam. He will talk about the reasons for these expeditions, the logistics and the results.